If you or a loved one are in need of health care, require advanced skilled nursing services and rehabilitation, then Lakeland Skilled Nursing and Rehabilitation Center is the choice for you. We provide excellent health care services in a homelike atmosphere and a partnership with the healthcare professionals who are dedicated to meeting your goals. You are at the first step in choosing a quality skilled nursing and rehabilitation center. Lakeland Skilled Nursing & Rehabilitation Center provides both short-term rehabilitation and long-term care at the highest standards. We provide comprehensive skilled nursing care using state-of-the-art medical equipment and progressive treatment plans promoting quality care. An interdisciplinary care team made up of nursing staff, therapist(s), resident dietician, activities and social services develop a customized plan of care that addresses specific care needs and therapy goals necessary for the resident. At Lakeland, we provide numerous programs and services to allow our residents to achieve their highest level of independent function. There may come a time when a loved one requires treatment of fluids through the vein, also known as Intravenous or IV therapy. Some of the things that can be administered through IV’s are medication, hydration, high protein, comfort medications etc. IV therapy can be used to treat infections, malnutrition, dehydration and electrolyte imbalances. Anyone caring for a family member who has some level of dementia, whether from Alzheimer’s or a stroke, knows how difficult it can be. The level of needs of the resident can vary from moment to moment and it can sometimes be a constant process of adapting. At Lakeland Skilled Nursing and Rehab Center, the staff is trained to identify and care for the special needs of those with dementia. Lakeland’s Director of Staff Development has completed a Dementia Professional Certification program through Ivy Tech College and the Alzheimer’s Association. The type and severity of a stroke influences the care and services required by residents with this diagnosis. Even residents with a history of a stroke in their past may still exhibit the lasting effects of stroke. The team at Lakeland strives to help residents recuperate to their highest possible level. The best outcome is for residents to be able to return home on their own, but sometimes, due to the nature of illnesses and other conditions they may need additional help in their home or may need continued care at the nursing facility. There are a variety of causes for different types of wounds that may present themselves. No matter what the cause or the type of wound, Lakeland’s team consisting of nurses, aides, wound nurse, physicians, pharmacy and laboratory all come together to help minimize pain, heal the wound and prevent recurrences. Our Certified Wound Nurse, Arlene Parr, works closely with our Medical Director and other physicians to see that we don’t just treat your wound but we treat the whole person. There is more to wound care than just changing a dressing. We are fortunate enough to have Arlene and her experience in this aspect of care. Swallowing difficulties can have many causes and can have many repercussions. “Dysphagia”, or problems swallowing, can lead to weight loss, dehydration, malnutrition, or a decreased ability to enjoy mealtimes with the ones you love. Whether you or a loved one are having problems due to a degenerative disease, stroke, or other cause, count on Lakeland to take care of you. Casey Newman, Speech Language Pathologist and Director of Rehabilitation for Lakeland, is the only SLP in the county certified in Vital Stim therapy for the treatment of Dysphagia. Through the use of Electrical Stimulation to the muscles of the throat, exercises, and family/resident education, Casey has had excellent success improving our Resident’s swallowing and decreasing dependence on artificial nutrition and hydration. This program is available both on an Inpatient and Outpatient basis. Contact Casey for more information at (260) 665-2161. Contact us today to find out more about what Lakeland Skilled Nursing and Rehabilitation Center can do for you! Lakeland Skilled Nursing and Rehabilitation Center is proud to present our Homeward Bound Program, focusing on short-term rehabilitation. Our therapy team is made up of physical, occupational, speech, and pulmonary therapists with experience in treating a variety of neurological, orthopedic, and medical conditions, including pain management, contracture management, and urinary incontinence management. 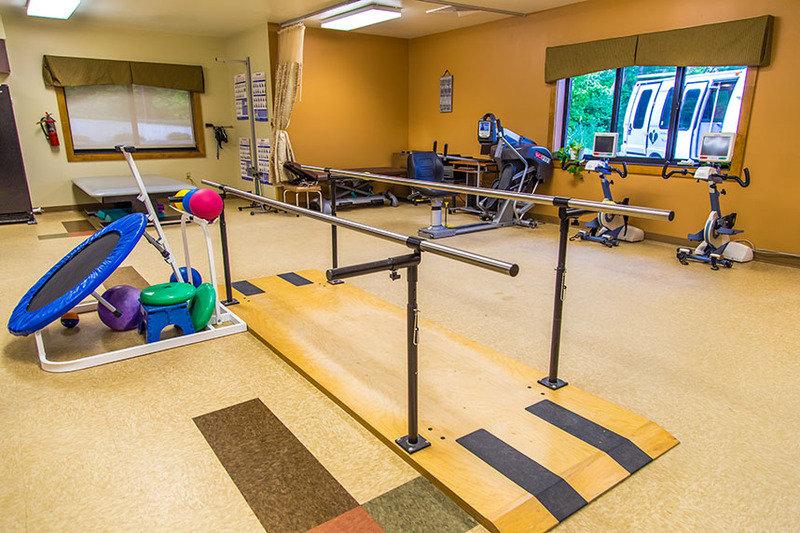 Each patient’s rehabilitation program is designed to address the specific needs of the individual in order to allow them to return to their maximum independence. Lakeland believes in combining cutting edge technology with proven therapeutic programs to improve outcomes, decrease length of stay, and to get each of our residents to their highest practicable level of function and discharged to home whenever possible. We provide individualized treatment programs, which allow residents to reach their maximum independence level. Family involvement in the rehabilitation process is encouraged because we believe that the family support and education are vital aspects in providing excellence in care and assisting the patient to maximize functional ability and independence. Lakeland strives to provide our community with the highest quality of service with the most advanced equipment available. Homeward Bound is short-term rehabilitation, which focuses on addressing the specific needs of each patient. Treatment programs are individualized in order to allow our patients to reach their maximum potential. Family involvement in the rehabilitation process is encouraged. We believe that family support and education are vital aspects in providing excellence in care and assisting the patient to maximize functional ability and independence. At Lakeland we have some exciting new programs that offer hope for dysphagia sufferers. We have three new dysphagia solutions designed to improve swallowing after stroke, brain injury, cancer, Parkinson’s, Multiple Sclerosis, Huntington’s Disease and other conditions. Synchrony: This system enables therapists and patients to visualize swallowing activity. A small, non-invasive sensor placed on the patient’s skin captures electrical activity of muscles. Specialized software displays this information on a color monitor for therapist and patient use. This program is provided by Accelerate Care Plus (ACP), a company that is revolutionizing rehabilitation. PENS (patterned electrical neuromuscular stimulation): This program produces gentle, rhythmic muscle contractions that retrain the muscles and nerves to fire in the right pattern. Synchrony can be used with or without PENS and vice versa. FEES (Fiberoptic endoscopic evaluation of swallowing): A bedside diagnostic test to evaluate dysphagia. In the procedure a small endoscope is advanced through the nasal passages to the back of the throat, where it can directly visualize the movement of foods through the esophagus (or, in cases of aspiration, into the larynx or lower airways). The test is especially useful in debilitated or intensive care patients who may not be able to swallow barium in the radiology suite for video fluoroscopy. We are the only provider of FEES and Synchrony in Steuben County. These services are available in our private speech clinic for outpatients or inpatients.